"I was making breakfast one morning and decided I wanted some kind of meat to go with my eggs and fried potatoes. 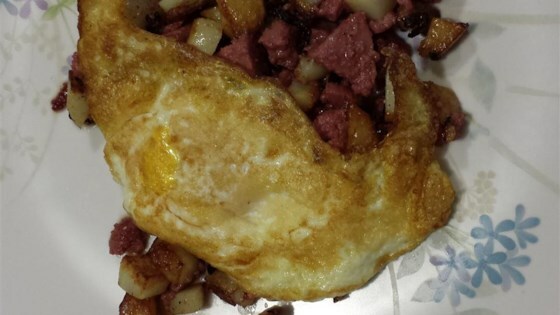 All we had on hand was some braunschweiger, so I tossed some in the pan with the potatoes and this dish was born." Heat vegetable oil in a large skillet over medium heat. Stir potatoes into hot oil to coat; season with garlic powder and onion powder. Place a cover on the skillet and cook, stirring occasionally, until the potatoes are browned and tender, about 15 minutes. Drain excess oil. Mash braunschweiger into the potato mixture. Cook and stir until the braunschweiger is hot and slightly crisp, about 5 minutes. Season with salt and pepper to serve. This is a tasty recipe that will stick to your ribs till dinner time. Das schmect gut! I sauteed fresh onions and garlic with the spuds. Perfect with soft sunny side up eggs. Thanks for the recipe! This is a keeper.